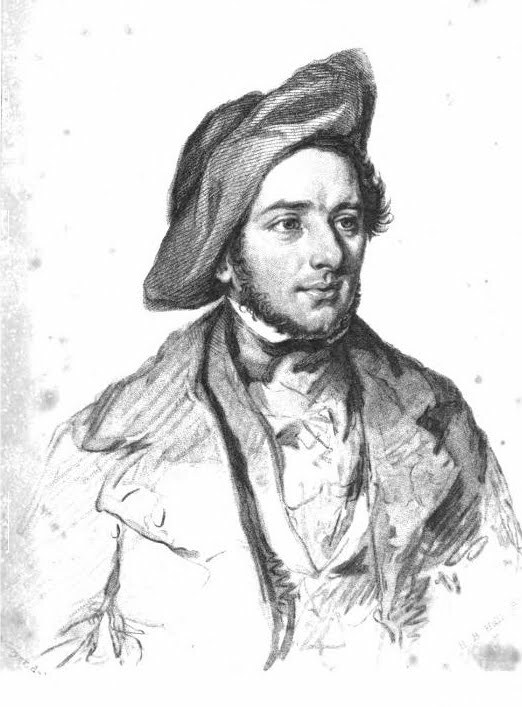 Ten years after designing the soup kitchen he did the same for the military during the Crimean War 1853-1856: paid his own expenses, created nutritious recipes from rations, stayed even after catching the fever (which he died year after end of war, in England) and invented the Soyer Stove, used by the military for over 100 years. M. SOYER'S MODEL SOUP KITCHEN. 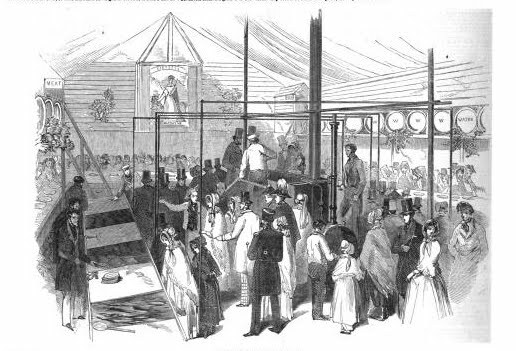 THE first soup depôt, erected on the plan devised by M. Soyer, on the Royal Barracks, at Dublin, was opened on the 5th inst., when the public were invited to attend on the occasion. A large and brilliant assemblage arrived on the spot at about three o'clock, and proceeded to inspect the various arrangements, and to taste the soups prepared by M. Soyer; and all who tasted, declared them to be excellent. There were present, amongst others, his Royal Highness Prince George of Cambridge, and a large circle of distinguished individuals. The exterior and covering is of a temporary nature, being formed of boards and canvas, enclosing a space of forty-eight feet long, and forty feet wide. The interior consists of a steam-boiler, on wheels, thirteen feet long, and four feet wide, with a glaze-pan over it, capable of containing three hundred gallons; and at the end an oven, to bake one hundred weight of bread at a time; and all heated by the same fire. Under the boiler is an excavation to contain coals, and round it an elevated platform to give access to the glaze-pan. At the distance of eight feet, round the boiler, are eight iron bain marie pans, with covers, six feet long, and twenty-two inches wide, on wheels, and made double, to be boiled by steam, and contain, together, one thousand gallons. At each end, extending between the pans, are the cutting-tables—at one end the meat, and at the other the vegetables; and under which are placed wooden soaking tubs, on wheels, and chopping-blocks for the meat drawers and sliding shelf. Four feet beyond these are placed a row of tables, eighteen inches wide, in which a hole is cut, and therein is placed a quart iron white enamelled basin, with a metal spoon attached thereto by a neat chain: there are one hundred of these, and this table forms the outer boundary of the kitchen; leaving a space of two feet six inches between it and the wall. 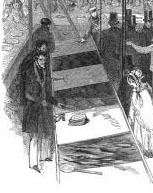 Inside of the table are fastened tin water-cases, at the distance of ten feet apart, containing a sponge, &c., to clean out the soup-basins. Round the two supports of the roof are circular tin boxes for the condiments. Seven feet from the ground at each corner is placed a safe five feet square, and seven feet high, with sides of wire, for ventilation, which contains, respectively, meat, vegetables, grain and condiments. At the same elevation as the safes are sixteen butts, containing 1792 gallons of water. At the entrance, in the centre, is the weighing machine. The fire being lighted, a certain quantity of fat or dripping is placed in the glaze-pan, and in the souppans the farinaceous ingredients, or thickening, along with the water. As soon as the fat is melted in the glaze-pan, the vegetables, cut into thin slices, or dice, are placed therein; after the lapse of ten minutes, the meat, which has been previously cut into small pieces, is added, and allowed gradually to fry, until the juice is extracted, and a good glaze formed, which will be in about thirty-five minutes. The condiments are then added, and the glaze is removed, and distributed equally in the bain marie pans: it is boiled for twenty minutes, and the soup or food is complete: this is the time used in making the soup, when such farinaceous ingredients as flour, oatmeal, and rice or barley, previously soaked, are employed; but peas, Indian corn meal, and many other ingredients, will take longer boiling. It is then ready to be removed by ladles into the basins in the surrounding tables. bread and biscuit room, where those who have partaken of the soup, and are departing, receive, on passing, a quarter of a pound of bread or savory biscuit; as I prefer giving it then instead of with the soup and food, it being sufficient for one meal without, and will not only save time, but, when eaten afterwards, will be more wholesome, and act more generously on the system, than when eaten in haste. When the soup, or food, is ready, notice is given by ringing the bell, and the one hundred persons are admitted, and take their places at the table—the basins being previously filled, grace is said—the bell is again rung for them to begin, and a sufficient time is allowed them to eat their quart of food. 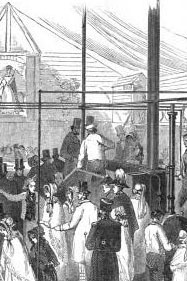 During the time they are emptying their basins, the outside passage is again filling; as soon as they have done, and are going out at the other side, the basin and spoon is cleaned, and again filled: the bell rings, and a fresh number admitted; this continuing every successive six minutes, feeding one thousand persons per hour: but as there are three thousand quarts more to distribute, which occupies only seventy minutes to make, other means must be used for distributing the food, for which purpose a door is provided at the entrance of the kitchen, to which persons come with tickets, which are given to them by district visitors, or subscribers; or, if not with tickets, to purchase the food, and which they take home with them. There are also provided carts and barrows for either horses, donkeys, or men to draw, containing from twenty-five gallons to two hundred gallons each, with fires attached, so that the soup or food contained in them should be hot or cooking on its way to the place of distribution. Such is a brief description of the kitchen. I also propose to change the diet every day, according to the provisions obtainable, and, on fast days, to give meagre food. At the particular desire of some charitable ladies, the Model Kitchen was set to work on Saturday last. The Ladies Ponsonby, Mrs. Peter Digges La Touche and daughters, Sir J. O. Vandeleur and Lady, Mrs. Williams, Miss Geale, Sir Thomas Deane, George Roe, Esq. (High Sheriff), D. Kinahan, Esq., Mrs. Windsor, Mrs. Elrington, Miss Bligh, Mrs. Holt, &c., were present, and most cordially seconded the efforts of M. Soyer, in dispensing with their own hands the food so amply supplied to them from this most admirable dépôt. There were nearly three thousand persons supplied. A few of M. Soyer's Receipts will be found in “Our Domestic Column,” in the present Number. HERE SATURDAY, APRIL 17, 1847. The same for one hundred gallons, to be made in the boilers, such as are given by the different relief committees, or in any other vessel, either iron or copper, in general use. Eight pounds of turnips, washed only, and cut into dice half an inch square , . . . .